The BEST baked vanilla donuts you’ve ever tried!! They’re gluten free, paleo friendly, and bound to be your new favorite weekend treat! Um. I BOUGHT A DONUT PANNN!!! I had a moment this weekend where I NEEDED a donut pan. My head just flooded with low carb/gluten free/paleo donut possibilities and it had to happen. Ok backstory. The past two weeks have been brutal. Bruuutaaall. Like in a way where whimpering is totally appropriate. I’ve been crazy sick for two weeks. I’m finally at the point where I’m coughing, so things are moving forward, but it’s that type of chest cough that physically pains my heart. On top of being in a mucous bubble, I’ve been having issues with my tooth and just today had to have an emergent dentist appointment where he did a small surgical procedure to fix it. It sounds dramatic. It’s not. It’s just a backstory illustrating that this donut pan was a much needed light of happiness amidst the headache. Ugh, she’s complaining again. I know, I know. But really, these last two weeks have been SO off. And I’m happy to being seeing some resemblance of health coming my way. Wait, what’s the diff between donuts and doughnuts. Ok, the internet tells me that doughnuts and donuts are basically interchangeable in America, though editors and everyone else in the world prefer the traditional “doughnuts” spelling. I’m so informative, see?! If you’re itching for ALL the different kinds of donuts or doughnuts, try these double chocolate babies with sea salt, or these peanut buttah ones. Your life will change foreva eva. I feel like I’m at a point in my life where sentences don’t have the same meaning unless I put an emoji at the end of them. There must be a way to incorporate them on my blog too, no? In a bowl, mix together the wet ingredients: melted butter, eggs, agave, and vanilla. Add the almond flour, coconut flour, sea salt, baking powder, and baking soda. Whisk everything together. Grease your donut pan and then scoop the batter into them. UPDATE: A super easy way to get the batter into the pan that I learned after posting this recipe is to transfer the batter into a plastic baggie and cut one corner off. Then, you can squeeze the batter easily into the donut cavity. Wayy easier than using a spoon. Or a spatula. Or fingers. Gently remove the donuts from the pan and place on a cooling rack. Mine easily popped out, but if you can use a butter knife along the edges to help you. Place the dark chocolate chips in a bowl and microwave for one minute. Stir and microwave for another 30 seconds, until the chocolate is smooth and drizzly. Drizzle the top (or bottom) of the donuts with the chocolate. You can also dip the top of the donut completely in the chocolate. Then, sprinkle on some color and a pinch of sea salt. If you want the chocolate to harden immediately, you can pop them in the freezer for a couple minutes. I’m totally obsessed with these, I know you guys will LOVE THEM!! In a bowl, use an electric handheld mixer to mix together the melted butter, eggs, agave, and vanilla. Grease your donut pans and then scoop the batter into them, filling them almost all the way. An easy trick to to put the batter into a large plastic baggie and cut off one end to easily squeeze it out in a circular motion to fill the circle pan. Place the dark chocolate chips in a bowl and microwave for one minute. Stir and microwave for another 30 seconds, until the chocolate is smooth and drizzly. Drizzle the donuts with the chocolate. You can also dip the donut completely in the chocolate if desired. Then, sprinkle on some sprinkles and a pinch of sea salt. If you want the chocolate to harden immediately, you can pop them in the freezer for a couple minutes. I love that these donuts are completely gluten free and healthy! Anyways, the closest thing I have to a donut pan is a mini bundt cake pan. It may work but it’s not quite the same thing! They look delicious!! Do you know fat/calorie content? Hi Lori! Thanks for the question! 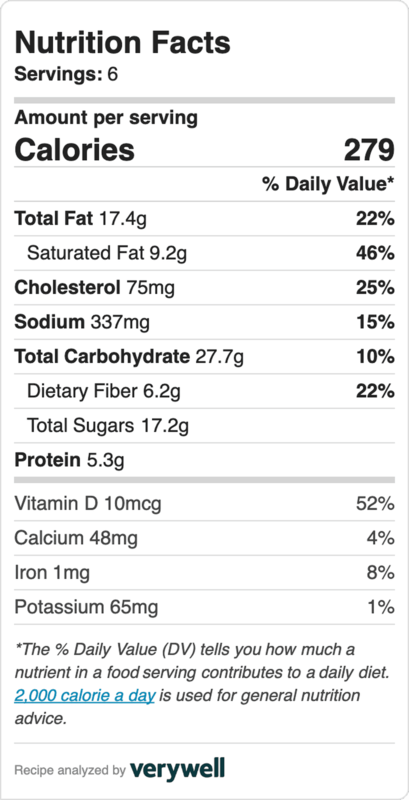 Each donut is 91 calories, 9.1 grams of fat, 5.3 grams saturated fat, and less than 1 carb. Hi Lindsay! Love your blog!! 🙂 my son is diabetic and I wanted to do this donuts for him-how many carbs do each donut have? Can I replace the agave with another sweetener? Which would you recommend? Thankyou ???? ummmm these donuts look ah-maz-ing! I love that you made them grain-free! These look amazing! I’ve contemplated a donut pan, but haven’t ever jumped in to get one yet!